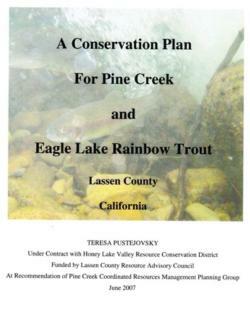 The Pine Creek Watershed in Lassen County is the primary tributary to Eagle Lake. This watershed contributes an estimated 75% to 85% of the surface flow into Eagle Lake. Subsequent planning efforts to accomplish most of these goals have resulted in more than a couple of decade of activities and projects that are still occurring at the present time. The Pine Creek Watershed Report written in 1989 by L. Stephen Young summarizes then-known facts about this watershed area. The report includes the results of field work done to inventory channel types and riparian zone conditions, and it outlines watershed improvement opportunities. The newly published article (July 2011) Long-term Captive Breeding Does Not Necessarily Prevent Reestablishment: Lessons Learned from Eagle Lake Rainbow Trout written by Gerard Carmona-Catot, Peter B. Moyle, and Rachel E. Simmons describes the captive breeding program for Eagle Lake rainbow trout which are peculiar to the Eagle Lake watershed of notheastern California.